This is the first visit of a sitting Pope since 1979. POPE FRANCIS WILL arrive in Dublin on Saturday 25 August and will be the chief celebrant at a Holy Mass in the Phoenix Park the following day. The Pope’s attendance in Ireland for the World Meeting of Families was previously known but the date of his arrival has now also been confirmed. The Holy Mass for the World Meeting of Families in Phoenix Park is expected to attract thousands of pilgrims from Ireland and from around the world. The previous visit by a sitting Pontiff to Ireland was in 1979 when Pope John Paul II also said Mass in Phoenix Park to crowd of 1.25 million people. Pope John Paul II also addressed crowds in Ballybrit Racecourse in Galway. The full schedule of this year’s visit by 81-year-old Pope Francis has not yet been released but his liturgy will bring to the World Meeting of Families to a conclusion. The Catholic gathering is held every three years and this year is being hosted in Dublin between 21 – 26 August. 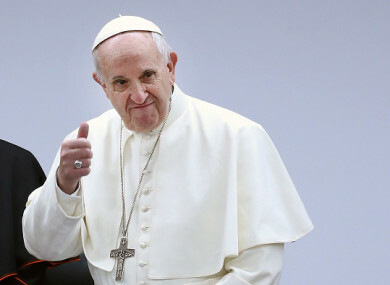 Pope Francis will also take part in the Festival of Families in Croke Park on 25 August. The Irish Catholic Bishops’ Conference has today warmly welcomed today’s confirmation of the papal visit. On behalf of the faithful of Ireland we warmly welcome today’s announcement, by the Holy Father himself, that he plans to visit Dublin in August for the World Meeting of Families. We are deeply honoured that Pope Francis will come to our country to participate in this universal Church celebration of faith and joy, as well as of the contemporary challenges which face families. All 26 dioceses on the island of Ireland are supporting the World Meeting of the Families, the organisation of which is being led by the Archbishop Diarmuid Martin of Dublin. Taoiseach Leo Varadkar said this morning that his government supports the Pope’s visit but noted that it did not constitute a State visit. “On behalf of the government I welcome the announcement by Pope Francis of his intention to come to Ireland in August for the World Meeting of Families. I look forward to meeting him during his visit,” Varadkar said. Email “Pope Francis to celebrate Mass in the Phoenix Park on Sunday, 26 August”. Feedback on “Pope Francis to celebrate Mass in the Phoenix Park on Sunday, 26 August”.